HOOKAH NIGHT!Hookahs for Rent on Outdoor Patio. Advance reservations required. Outdoor service only. Quantity limited, so call now and reserve your shi-sha! Al-Fakhr tobacco. Choice of Double Apple or Mixed Fruit. 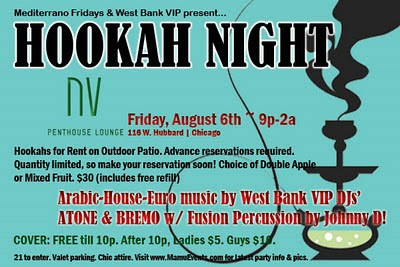 $30 (includes free refill).Arabic-Euro-House music by West Bank VIP deejays ATONE & BREMO w/ Fusion Percussion by Johnny D!Cover: Comp Entry till 10p. After 10p, Ladies $5 and Guys $10.21 to enter. Valet parking. Chic attire.